Santacon participants walk down MacDougal Street on Saturday, December 13, 2010 in New York, NY. Additional photos from the event are available Flickr. 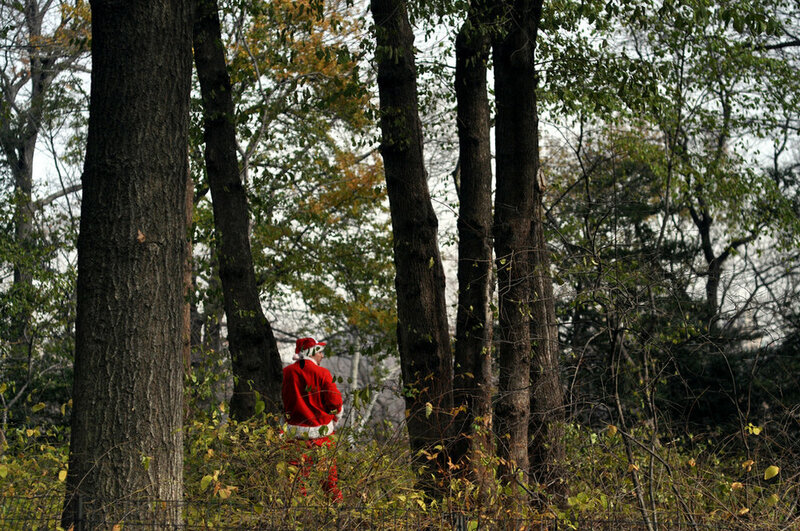 A Santacon participant stands on MacDougal Street in the West Village on Saturday, December 13, 2010. A Santacon participant stands on MacDougal Street in the West Village on Saturday, December 13, 2010. Additional photos from the annual event are available on Flickr. A man entering the W. 4th subway notices the hundreds of Santacon participants exiting the station. A man entering the W. 4th subway notices the hundreds of Santacon participants exiting the station. Additional pictures from the annual event are available on Flickr. Red and green stockings and green shoes. 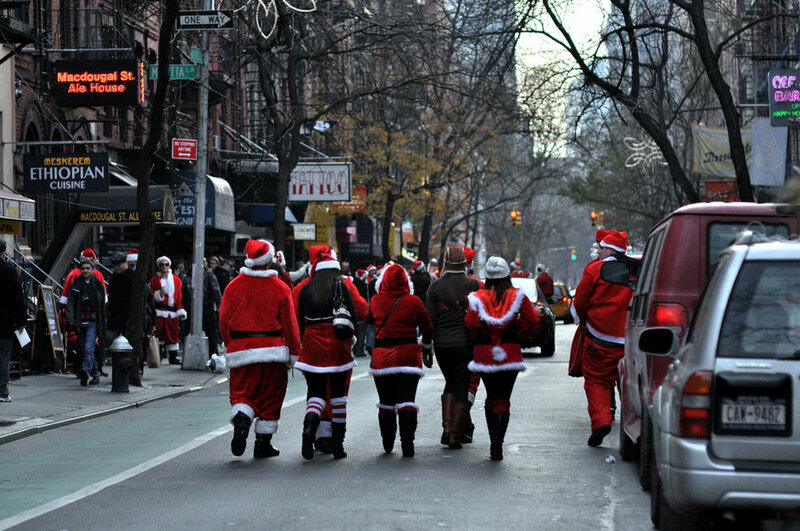 Santacon participants pose on their way to the Grand Army Plaza subway station in Brooklyn, NY on Saturday, December 12, 2009. Additional pictures from the day are available on Flickr. Taken at the Grand Army Plaza subway station in BRooklyn, NY during Santacon 2009. 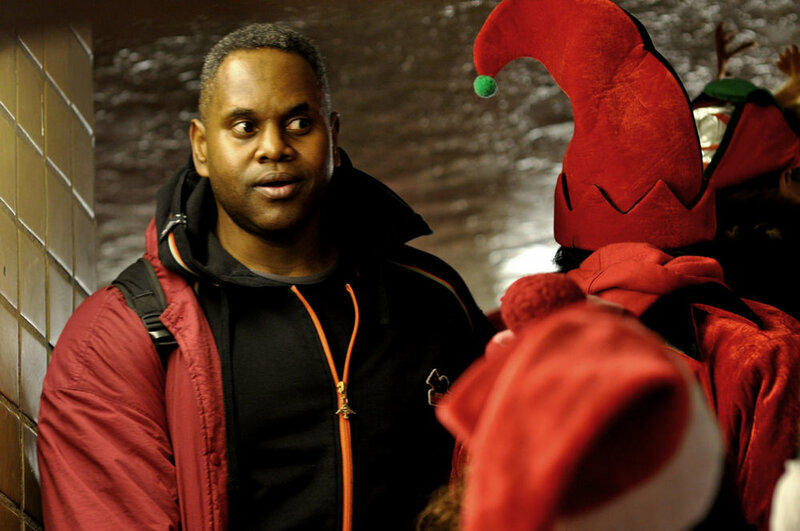 Santacon participants board the subway to Wall Street on Saturday, December 12, 2009. Additional pictures from the day are available on Flickr. 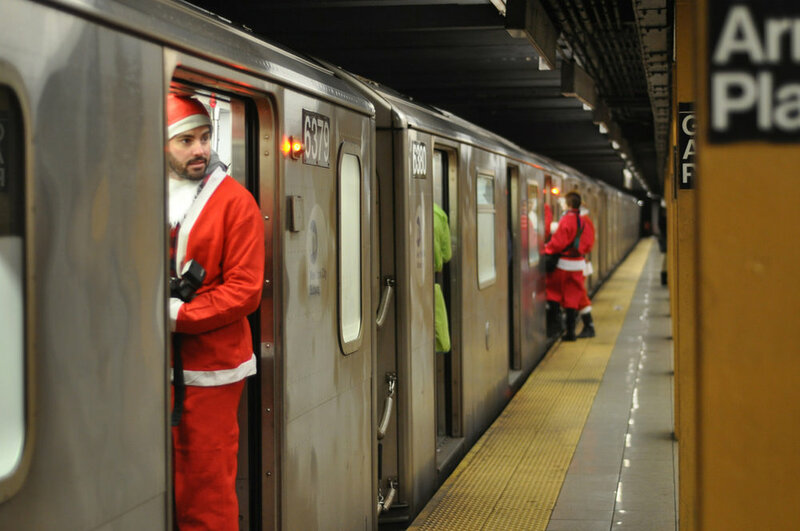 Santacon participants on a Manhattan bound 3 train in Brooklyn, NY on Saturday, December 12, 2009. Santacon returned to New York City on Saturday, December 12, 2009 with participants meeting up in five locations outside of Manhattan.The above was taken in Brooklyn at the Grand Army Plaza subway station while the participants were en route to Wall Street. Additional pictures from the day are available on Flickr. Participants during Santacon talk to each other at the South Street Seaport on Saturday, December 13, 2008 in New York, NY. 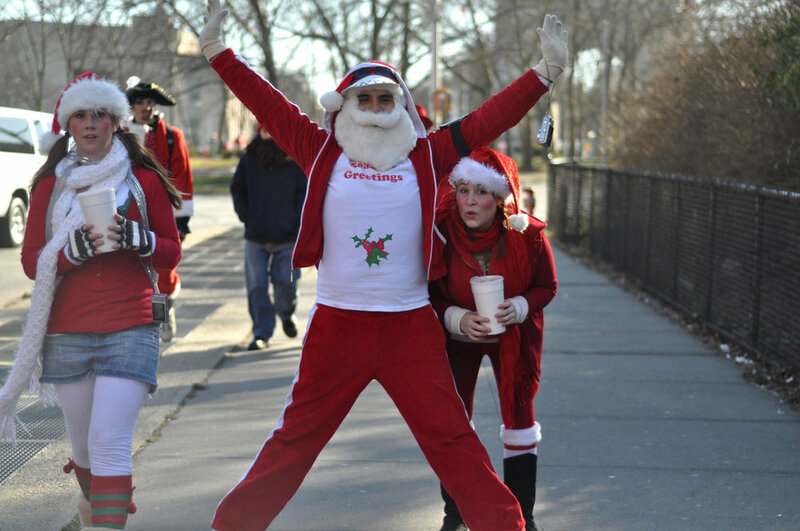 Additional photographs from the 2008 New York Santacon are available here. A man dressed as Mrs. Claus during Santacon on Saturday, December 13, 2008. Additional photos from the event can be found on Flickr. Two Santacon participants wear sunglasses on Saturday, December 8, 2007 on W. 45th Street. Additional pictures from the event appear in this Flickr set. A friend, dressed as a Christmas Tree, on Astor Place during Santacon on Saturday, December 8, 2007. Additional pictures from the event appear in this Flickr set. 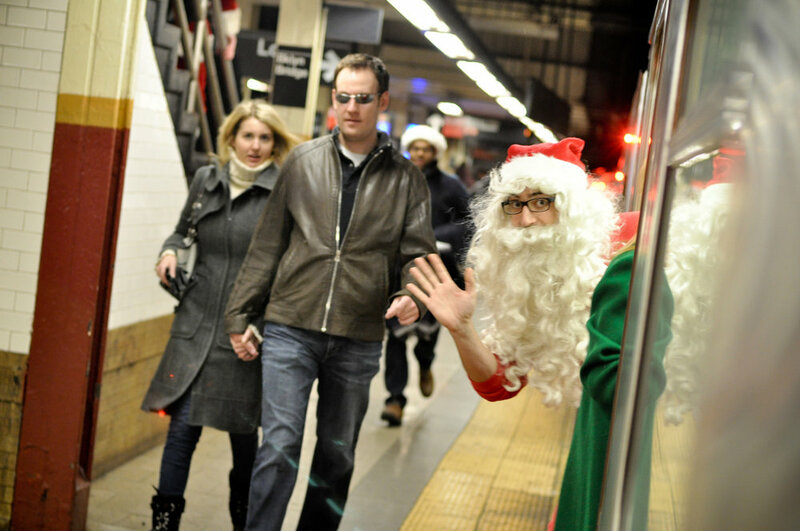 Santacon participants were instructed to take the 6 train to Astor Place on Saturday, December 8, 2007. Additional pictures from the event appear in this Flickr set. A Santa takes a drag from her cigarette on W. 45th Street during Santacon on Saturday, December 8, 2007. Additional pictures from the event appear in this Flickr set. A Santacon participant provides music for other revelers on West 45th Street in Manhattan on Saturday, December 8, 2007. Additional pictures from the event appear in this Flickr set. Participants in the annual Santacon walk downstairs at the Spring Street subway station on Saturday, December 8, 2007. Additional pictures from the event appear in this Flickr set. A Santa from Santacon takes a seat on the subway. Additional photos from the event are available in this Flickr set. Santacon photos that were posted on this site are all here.